Another breaking the record episode of Kalyeserye that generates over 22 million tweets in just a matter of more than six hours and its still counting as of writing this post. 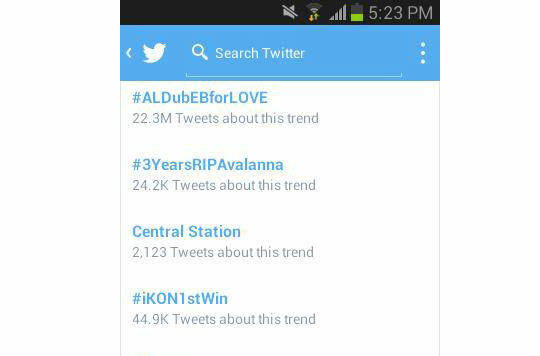 The hashtag #ALDubEBforLOVE is for the 'Akyat-Ligaw' episode of Kalyeserye this Saturday, September 26, 2015. All AlDub Nation members and supporters are joined force to surpass the last week record tweets on #AlDubMostAwaitedDate. This is the second date for Alden Richards and Maine Mendoza. Everybody was so happy and in the 'kilig-moments' because the two are now 1-foot away to each others. On their first date, Alden and Yaya Dub are finally met face to face. But now! they even have their first picture together and first 'Hawak Kamay'. According to the news, even Eat Bulaga began showing, the tweets reached around 13 million earlier today. Its still increasing and maybe will reached around 23 to 24 million tweets. Comments or suggestions about "#ALDubEBforLOVE garnered over 22 million tweets" is important to us, you may share it by using the comment box below.